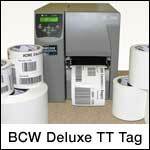 The BCW Deluxe TT tags are a coated, white paper tag stock with excellent ink receptivity and super crisp barcode and text images. Ideal for general purpose ticketing, shop floor tracking tickets, retail hang tags, and inventory control tags. For outdoors or otherwise harsh conditions, consider the BCW Tuff Tag or BCW V-Supreme Tag. Use with BCW Wax Ribbon. 3.00" x 4.00" thermal transfer 7 mil tag on a 3" x 8" core. 1200 labels per roll / 4 rolls per case. BCW 2385175 special features - Perforated. Use with BCW Wax Ribbon. 4.00" x 2.00" thermal transfer 7 mil tag on a 3" x 8" core. 2400 labels per roll / 4 rolls per case. BCW 2385235 special features - Perforated. Use with BCW Wax Ribbon. 4.00" x 6.00" thermal transfer 7 mil tag on a 3" x 8" core. 800 labels per roll / 4 rolls per case. BCW 2385295 special features - Perforated. Use with BCW Wax Ribbon.